Caravan Star II CS is a free shoot’em up with a hint of classics such as Uridium and Xenon, but with a particular twist – the game is over in just 2 minutes. It may sound like the game with the worst longevity ever, but that’s something inherent to the game itself. The idea is to use the valuable 2 minutes to achieve the highest score possible, and then do it again and again to improve that little bit and vanquish the previous performance. 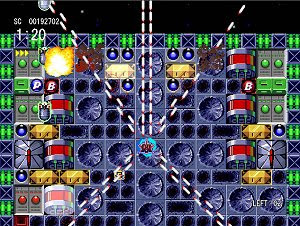 This is non-stop arcade action with bullets everywhere, the player choosing from 6 different ships, each one with specific abilities such as speed and firepower. This obviously will make a difference in the final score, depending on which ship the player feels most comfortable. The enemy attack waves can also be different each time we start, making things much more unpredictable and challenging. Gameplay is smooth and fast-paced, with the destructible background offering bonuses that improve our ship’s abilities. Visuals are functional but somewhat generic, akin to the shooters seen in the Commodore 64.